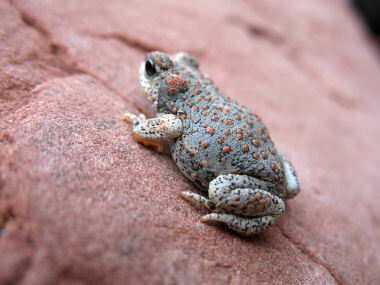 The Red Spotted Toad is a is a small toad (about 1.5 to 3.0 inches in length). It has a flattened head and body, and light grey, olive or reddish brown skin with reddish or orange warts. It has a whitish or buff underbelly, and round parotoid glands about the size of their eye. Parotoid glands are external skin gland behind the eyes which secrete an alkaloid milky substance to deter predators. It has a high-pitched musical trill which lasts up to 10 seconds. The toad is found throughout the state of Arizona in desert streams and rocky pools, they also occur in grasslands, shrublands, river floodplains and desert tinajas (small potholes of water). Isolated cattle tanks or stock ponds make good breeding sites, as well. Red Spotted Toads move by walking, instead of hopping. Red Spotted Toads are mainly nocturnal, remaining underground in the daytime, but they are occasionally seen moving about in daylight or resting at the edge of breeding pools in the breeding season. They are good climbers, easily climbing over rocks. They eats a wide variety of invertebrates which they locate visually, then use their large sticky tongue is used to catch the prey and bring it into the mouth. Breeding is brought on by rainfall and occurs between March - September. Females lay eggs singly, instead of in a string, on the bottom of the water.